Hi again! 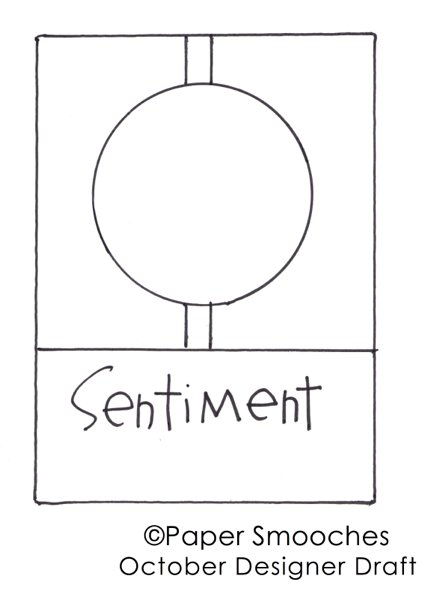 I've got one more card for you today. 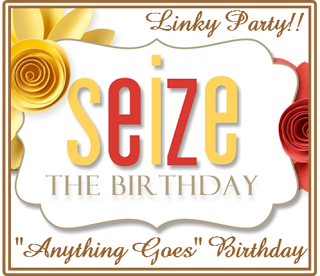 I'm entering this in the Simon Says Wednesday Challenge to use kraft and over at the Seize the Birthday challenge as an Anything Goes card. 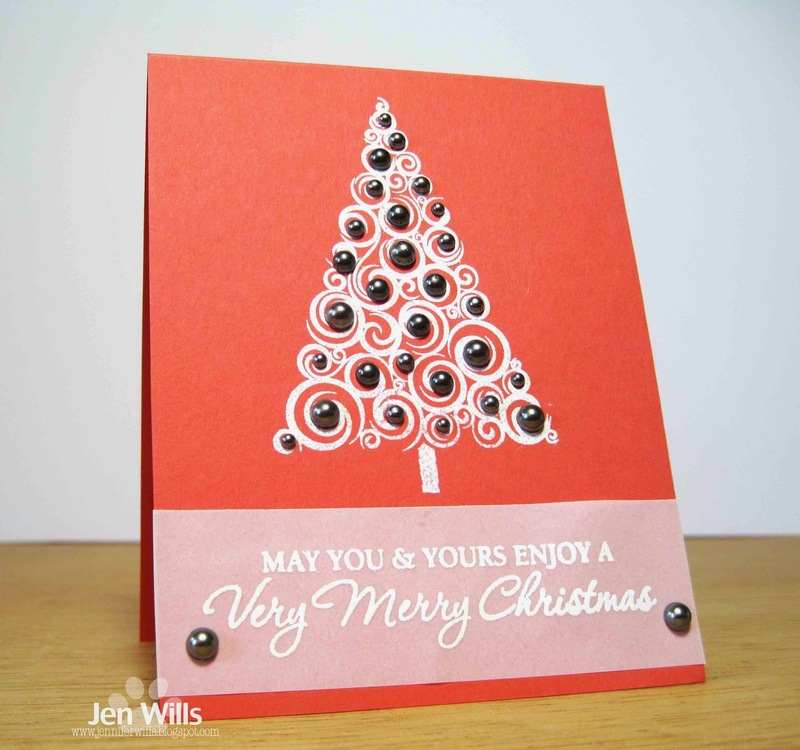 I used Hero Arts ink daubers to create the polka dots. 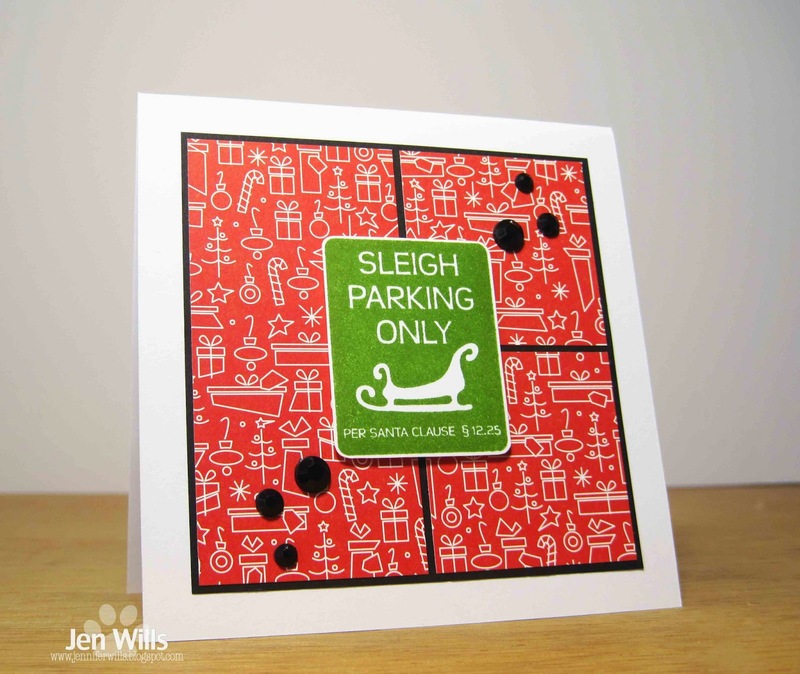 I stamped them all in white first and then went over them in different colours. 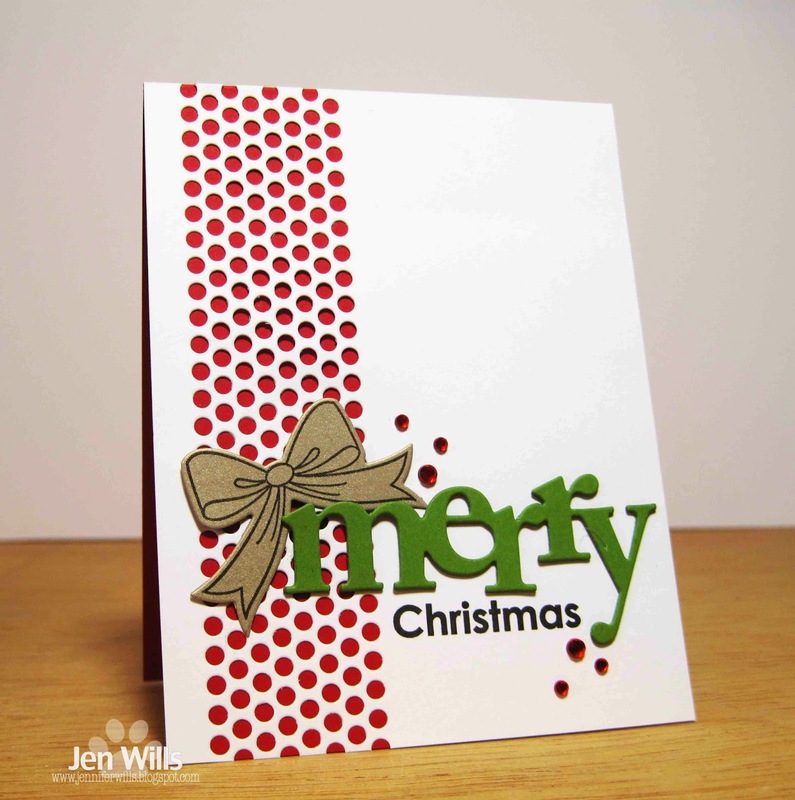 I heat embossed the sentiment over the top of the dots and then smeared Star Dust Stickles over each of the dots for some shine. They're so fun and sparkly in real life! That's it for today. Have a lovely evening! 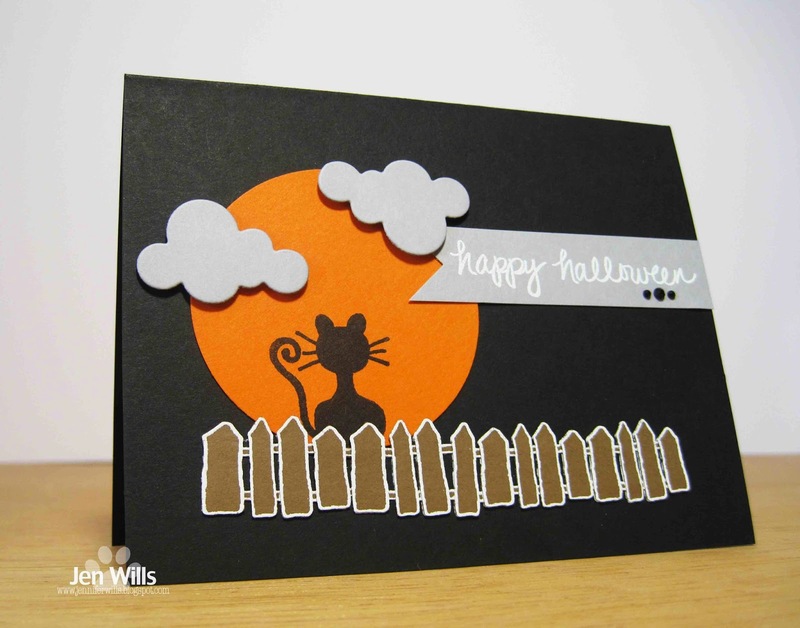 I was giggling to myself as I posted this card on the Design Team Blog because it really looked like I'd posted the wrong card for this challenge. That song from Sesame Street kept coming into my head - "One of these things is not like the others…"
I do have a couple of ghost stamps (including the cutie showcased by Judy) but I kept hearing "ghost stamping" in the back of my mind whenever I though of the challenge. 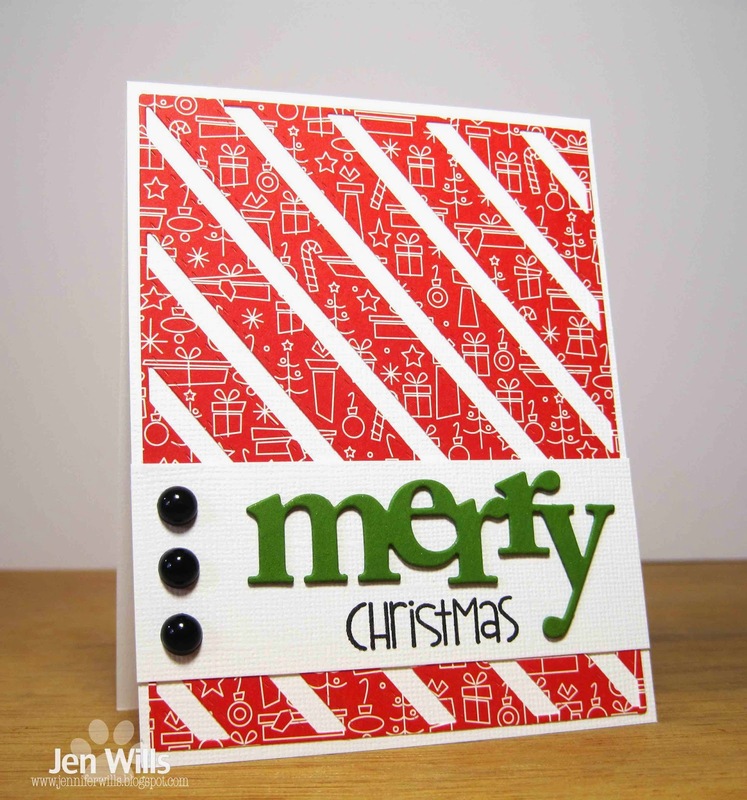 I figured it was some long forgotten stamping technique but couldn't remember exactly what it was so I finally googled it and ended up watching this video by Jennifer McGuire. So there you have it - the cue word inspired me to use the ghost stamping technique. How will it inspire you? 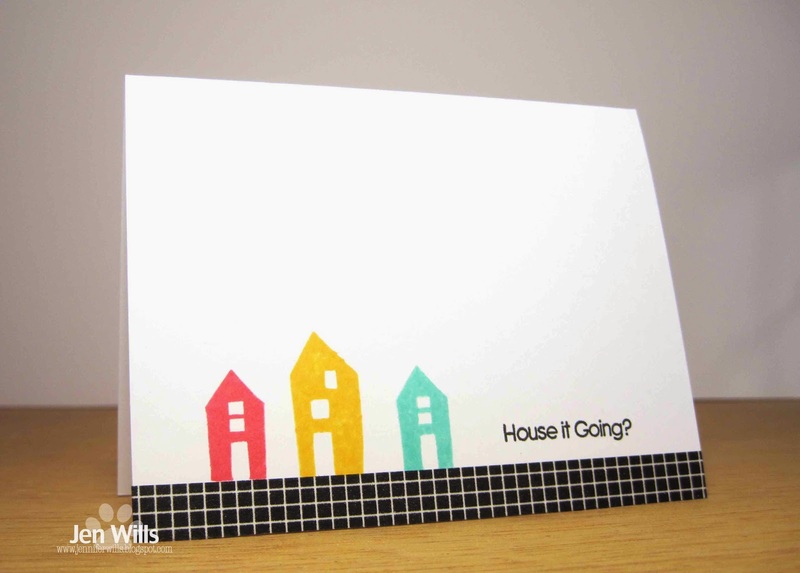 Check out the fabulous designs from the rest of the team and then play along! 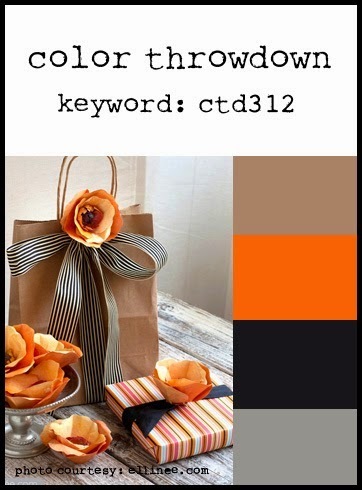 Today's card is made using the palette from the Colour Throwdown challenge. 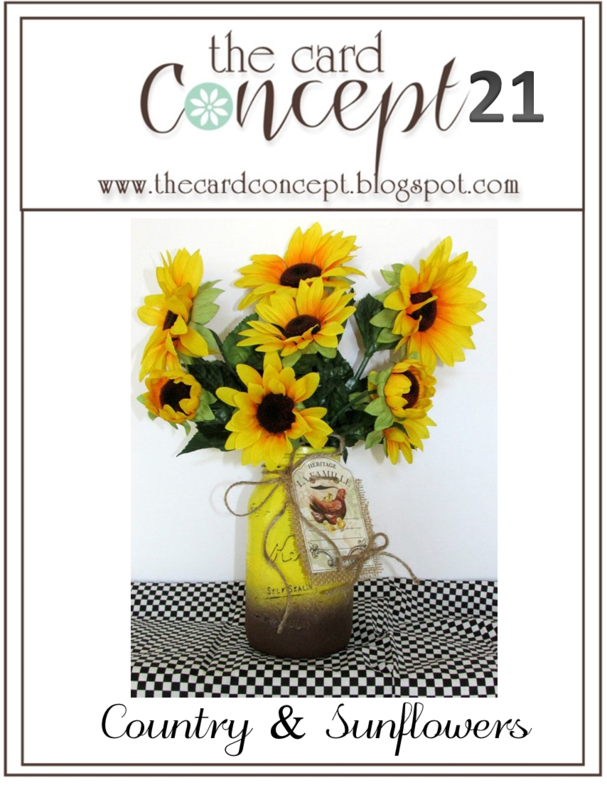 In real life the yellow card base is significantly lighter in colour than the yellow vase but in this photo it all looks the same. 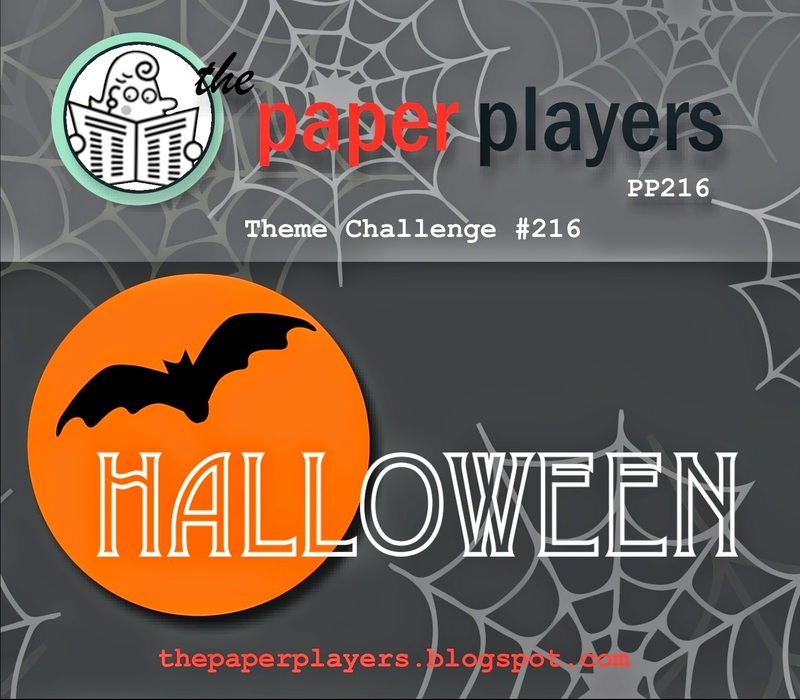 I guess that may disqualify me from the challenge but I wanted to share the card anyway. Now off to get going with my day. Hope yours is a good one! Hello and happy Sunday! 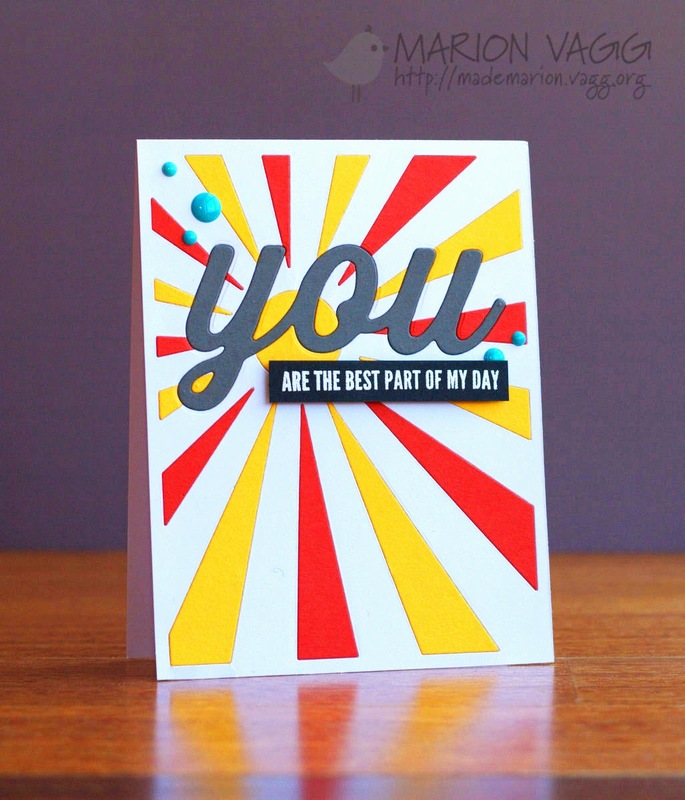 I have cards to share for two challenges today. 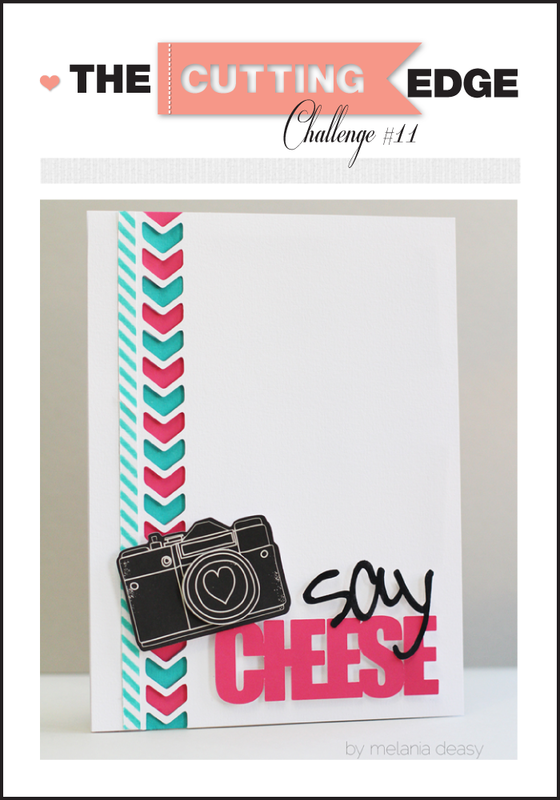 First up is my take on Marion Vagg's card over at the Muse challenge. 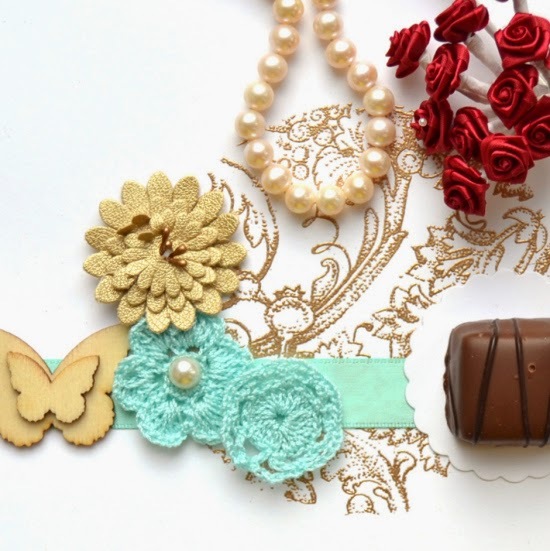 I was inspired by the colours and explosive feel of the design. 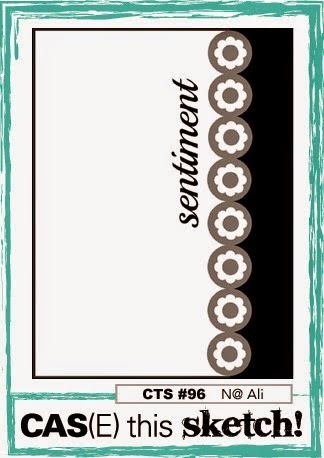 I used my Paper Smooches Bam Bubbles for my explosion, a PTI "you" die and a partial sentiment from Altenew. 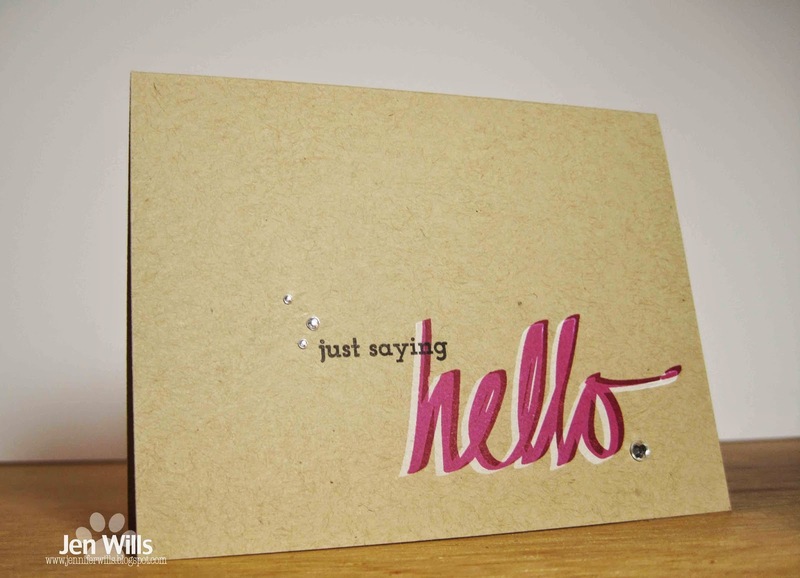 I also made my own enamel dots using hole punches and Glossy Accents. Next up is a card for the Card Concept challenge. 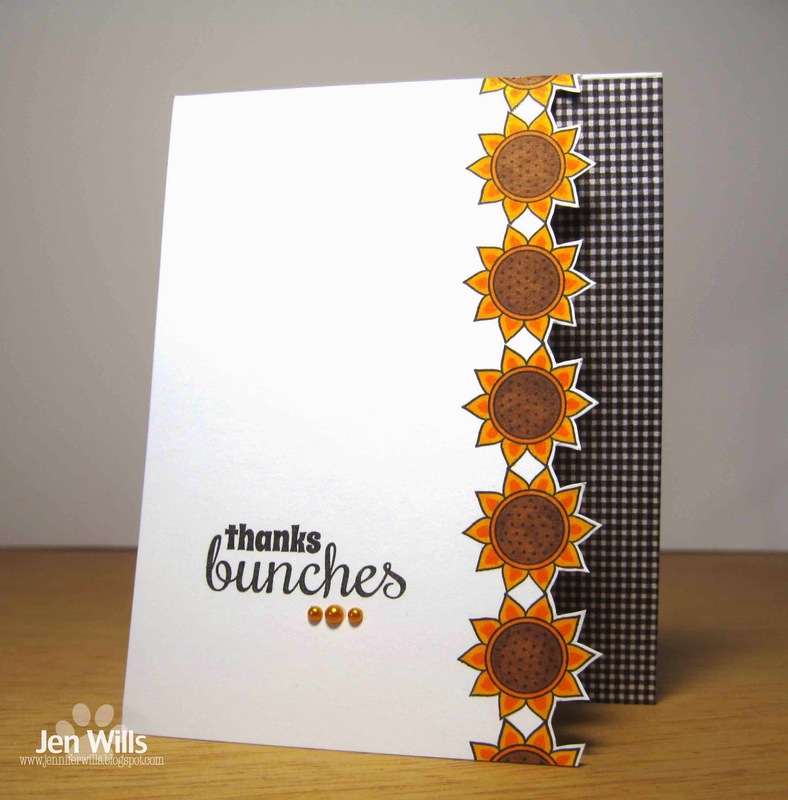 I was inspired by the sunflowers and checked tabletop to make this Clean and Simple card. I also used last week's CAS(E) This Sketch sketch but since the internet was down I couldn't post it on time for that challenge. That's it for today. See you tomorrow! Hi there! Our internet service has been patchy since all the storms last week but it's up and running this evening so I'm hoping to catch up with visiting some blogs. 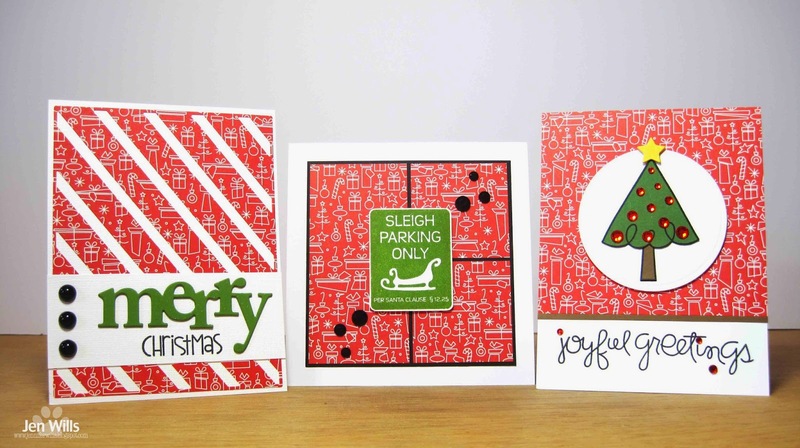 I also wanted to post 2 cards for the current Merry Monday challenge to use non-traditional Christmas colours. 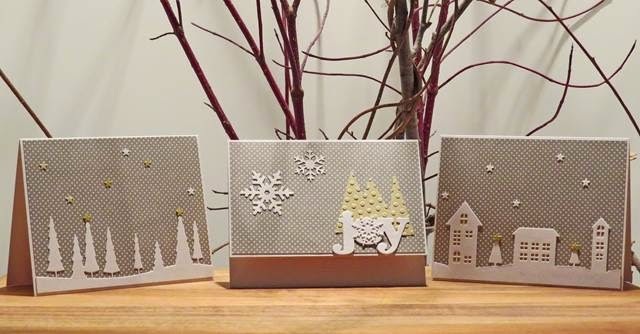 Although I have lots of wintery images (snowmen, snowflakes, etc) I tend to steer away from them and I try to find ways to incorporate a bit of an island feel into my Christmas cards. 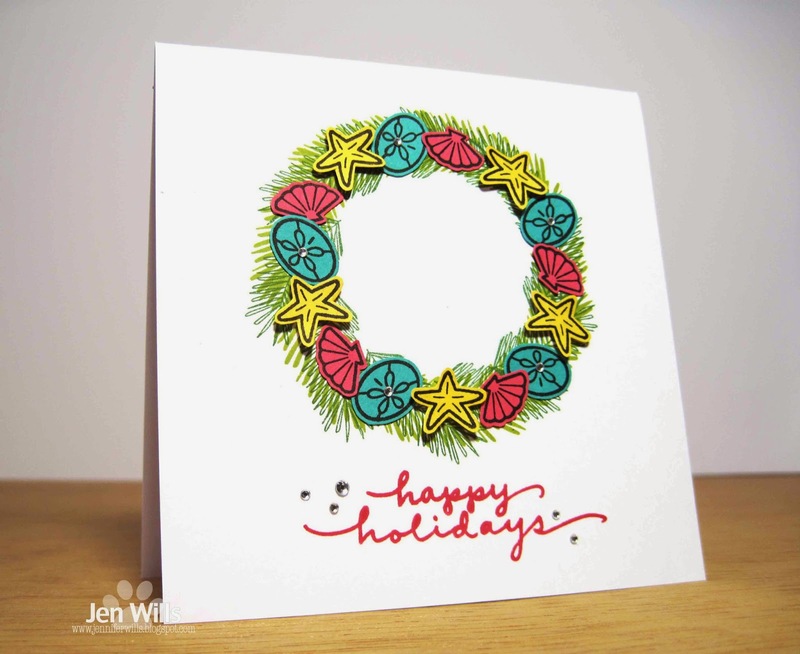 I used shells and starfish to decorate the wreath on my first card and then on my second card I used a coral coloured base. That's it for me tonight. 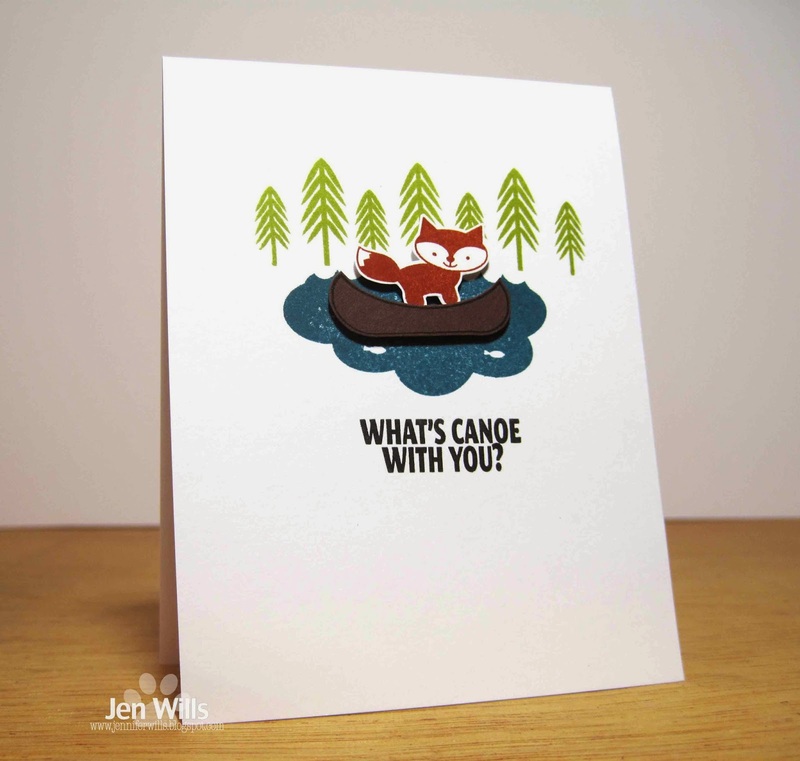 Hope you're all having a lovely weekend! This week's cue word seems very appropriate as today I am grateful that my home is safe and undamaged. Last week Bermuda was hit by two storms within 6 days. 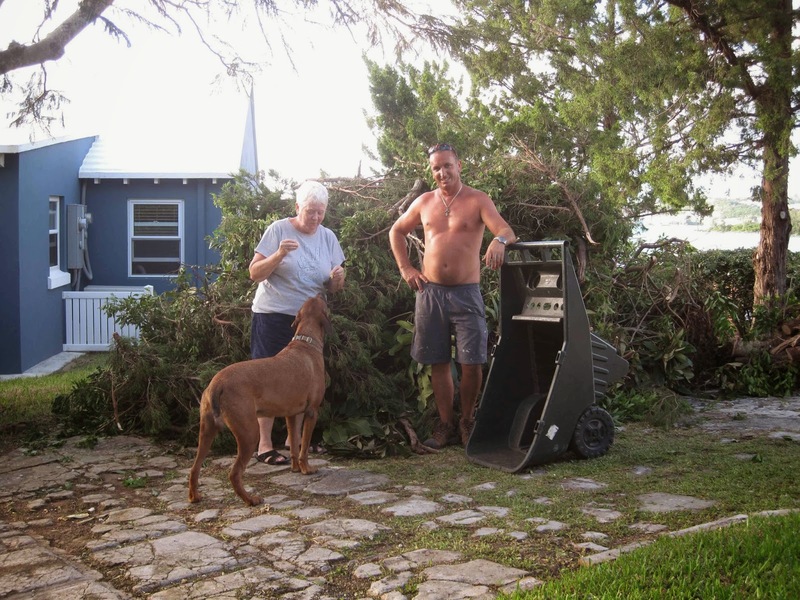 Tropical Storm Fay hit us on Sunday followed by Hurricane Gonzalo on Friday. TS Fay ended up being a blessing in disguise. It caused a lot of damage but it also cleared out a lot of trees which greatly lessened the impact of Gonzalo. My family has been so very lucky. While we lost a lot of trees and had damage to our waterfront our house is fine and so are we. A lot of people lost roofs and some people haven't had power since Fay hit. We got power back quite quickly although internet and cell services have been erratic. I wasn't sure I'd get to play along this week as we've had a long slog of cleaning up but I managed to get into the Craft Cave for a bit yesterday afternoon. It felt so good to get inky again and our internet came back over night just in time for me to post. 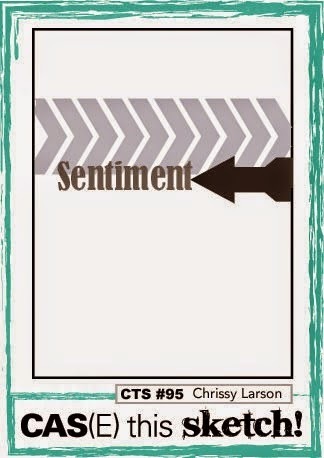 It's not my best card ever but I'm grateful to be able to make one at all. Be sure to head over to the CASology page and check out the gorgeous designs from the rest of the design team and then play along! Hi there! 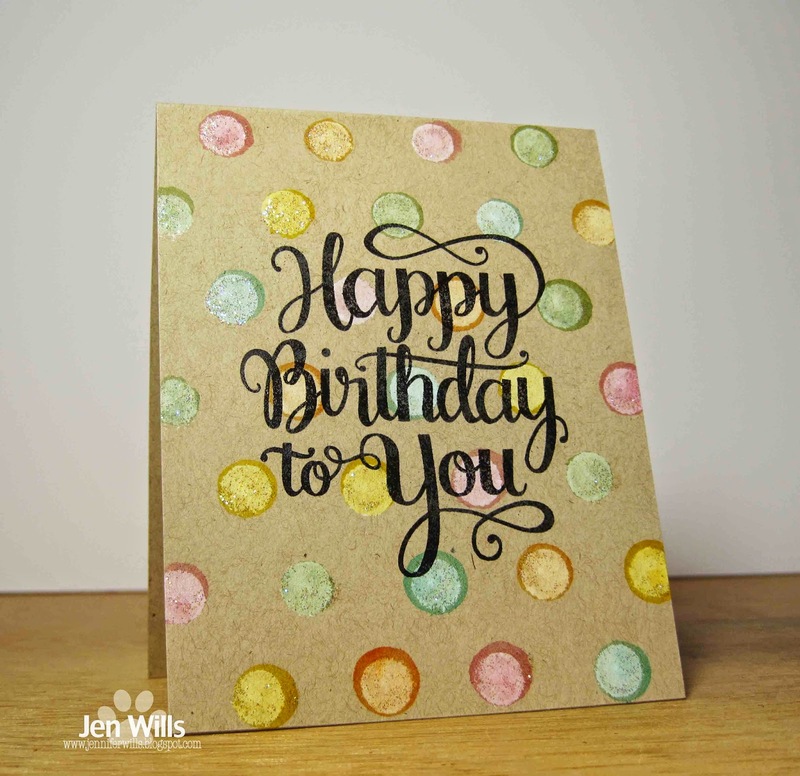 I'm popping in today with a card for 2 challenges. I took the sketch from CAS(E) This Sketch (turned 180 degrees) and paired it up with the Seeing Red Recipe Swap from Catered Crop and came up with this. 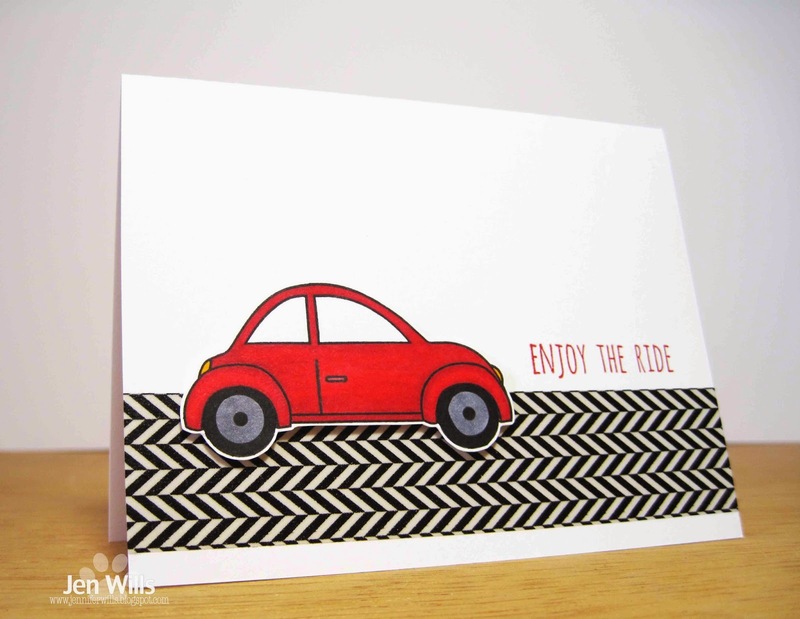 I thought this fun washi tape would make a great road for a bright red VW Bug to zip along! I coloured the Bug with some Copics and popped it up on foam tape to finish it off. Hope you all have a lovely day! In school from Primary 4 through Primary 7 we had to write with fountain pens. When I started P4 I was so excited about graduating from using pencils to writing with a pen. How grown up! The excitement wore off pretty quickly once I realized how messy they could be. 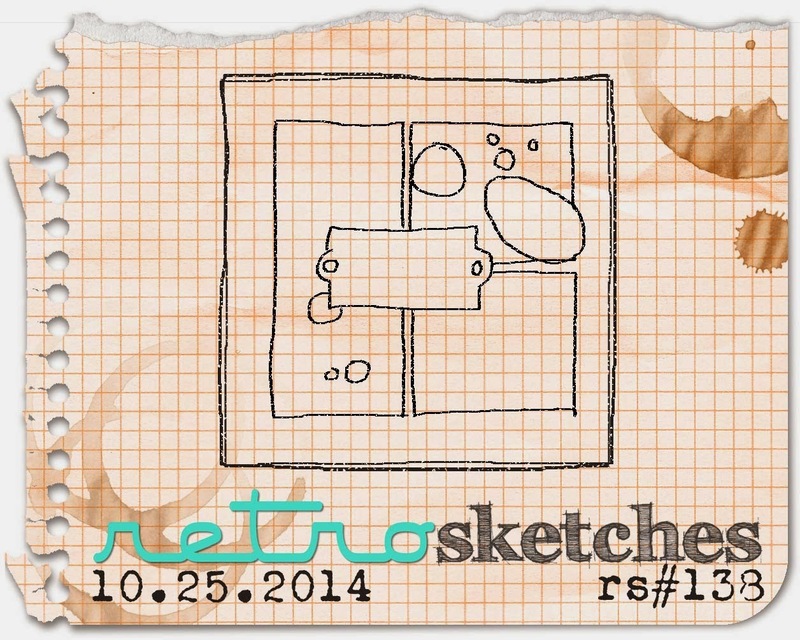 My work suffered from many an ink splat and splotch over the years! 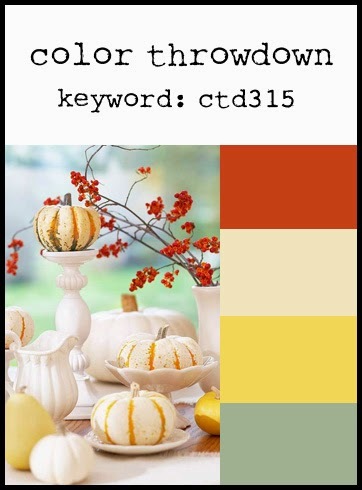 Thus you can see the inspiration for this week's card. And now it's your turn to splatter. 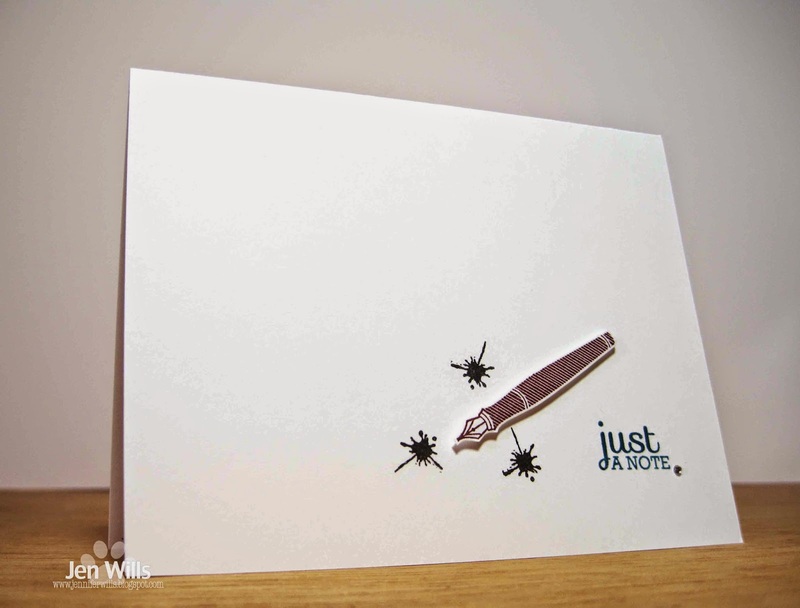 Check out the splattery fun from the design team and then get messy! Hello again! 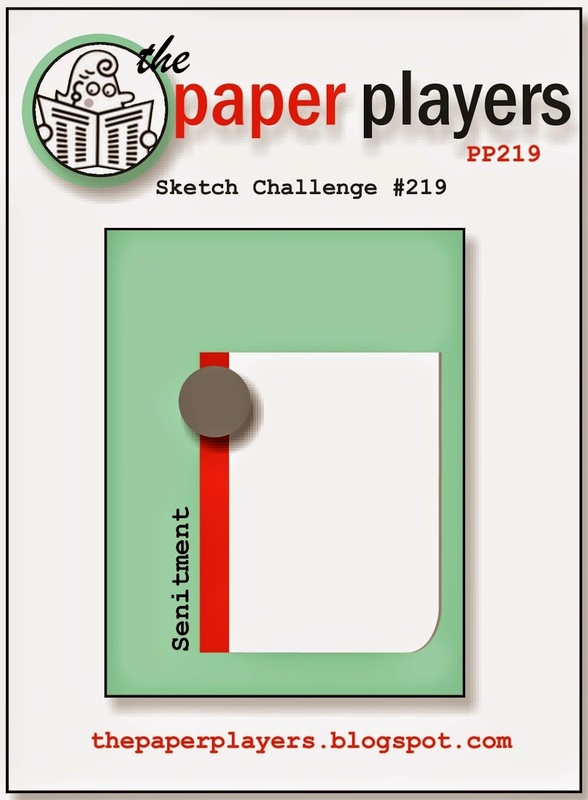 I ended up having some time today to make a card for three challenges. 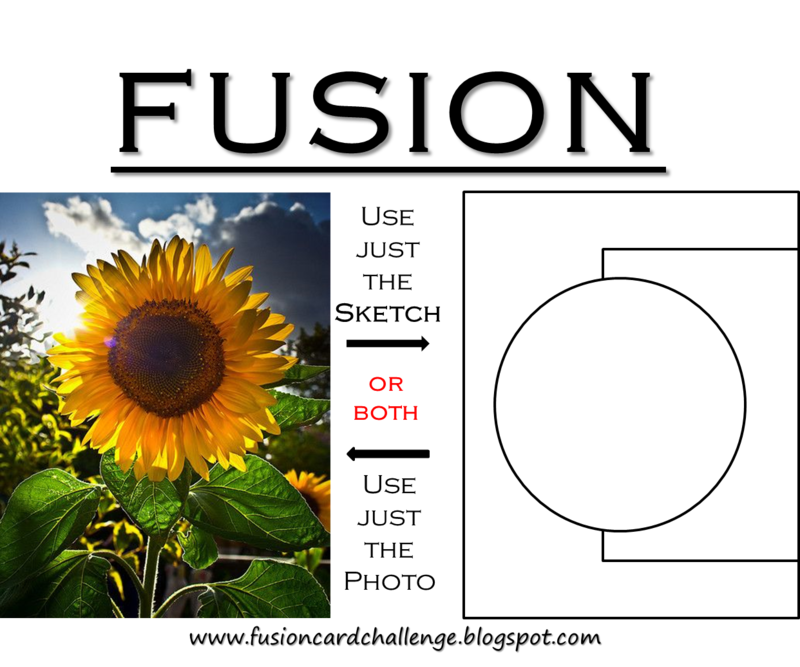 The initial inspiration came from the photo at the Fusion challenge. 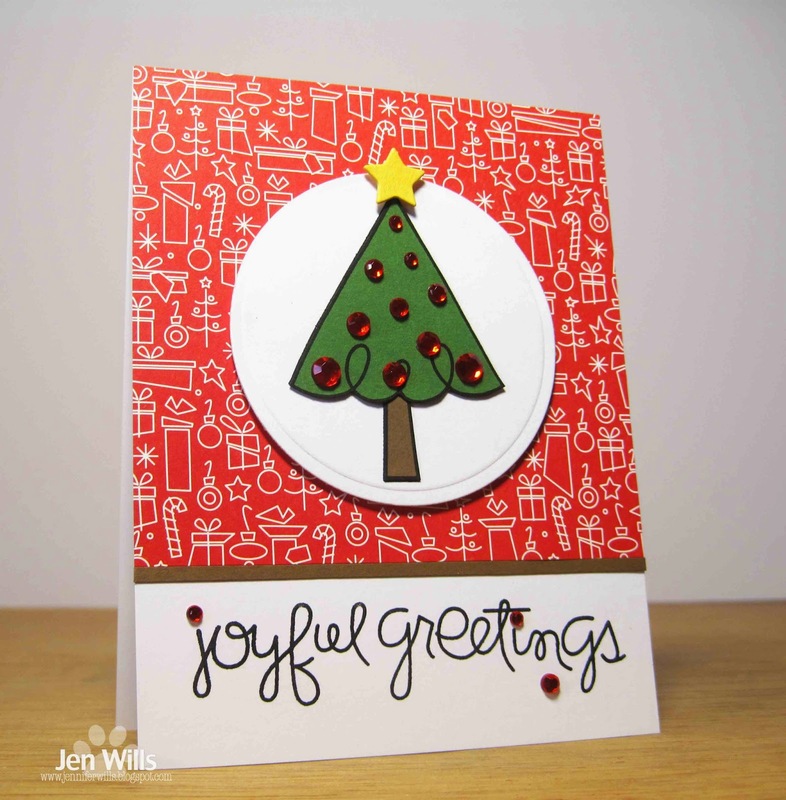 It's a CAS design so I'm entering it in the Virginia's View Clean and Simple challenge and since I used all stamping I'm joining in with Time Out's stamping challenge (but not using the optional twist of apples). 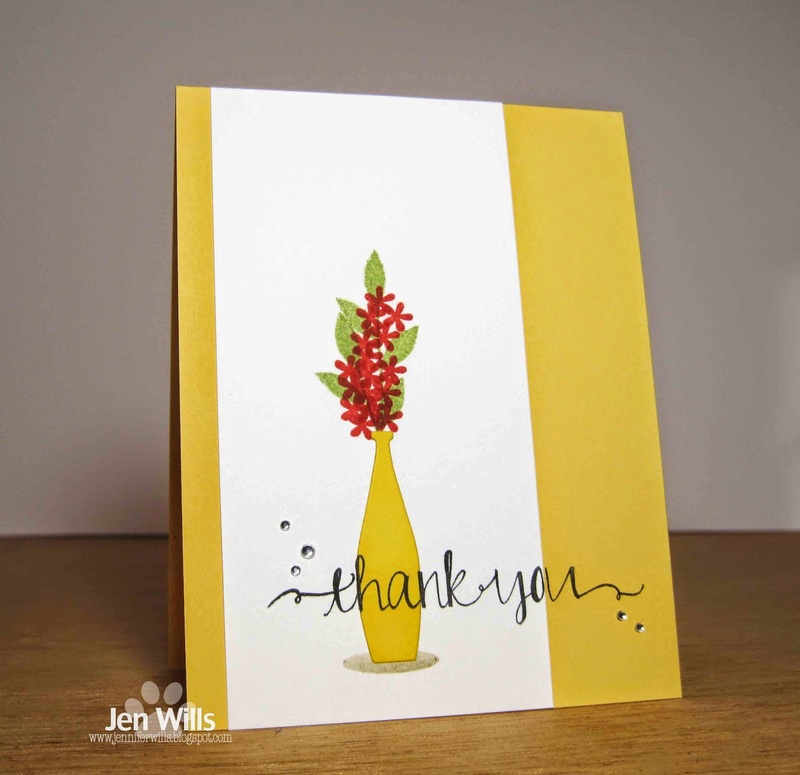 I stamped the CAS-ual Fridays flower onto yellow cardstock and then added some highlights to the petals with Copics and then used Cinnamon Stickles on the centre of the flower. 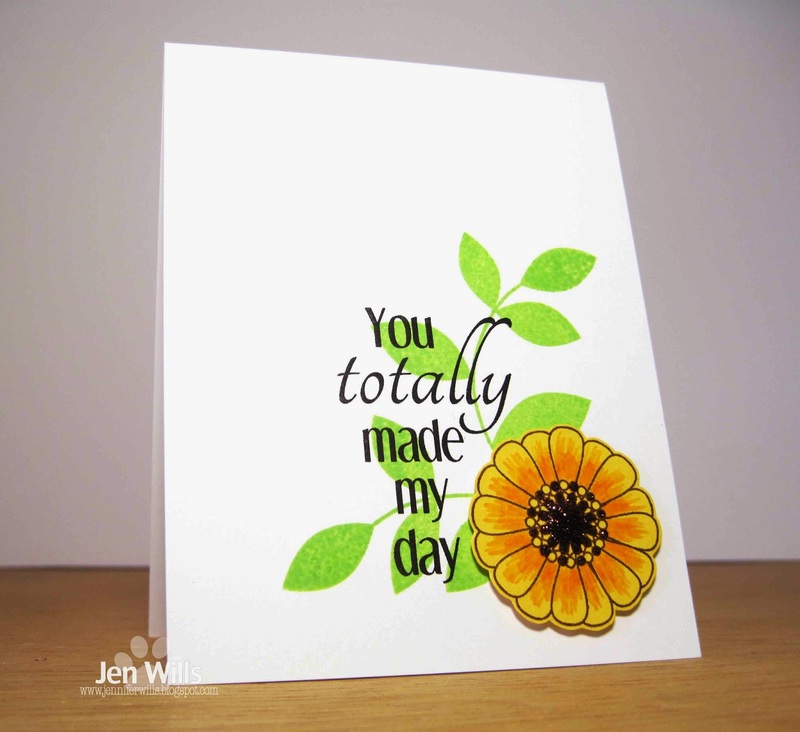 I stamp layered the leaves and sentiment and then popped up the flower for a little dimension. Okay, that's really it for today. I'll be back tomorrow! 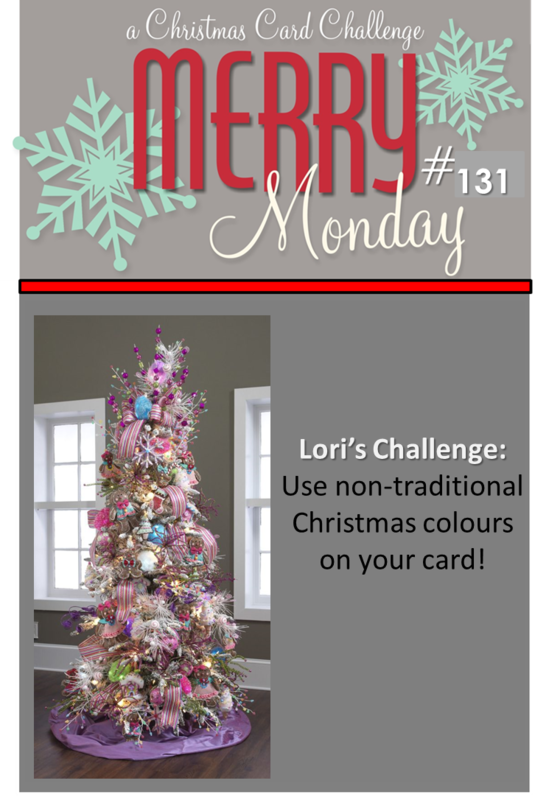 Since I've had so much fun playing along with the Merry Monday challenge I decided I should check out the Festive Friday challenge as well. The photo they provided this fortnight immediately sparked an idea in my head and it actually translated pretty easily onto my card. Love when that happens! I made the wreath using branches from Papertrey's Bells & Boughs set (here it is again!) and added some Stickle berries to it for some colour and shine. 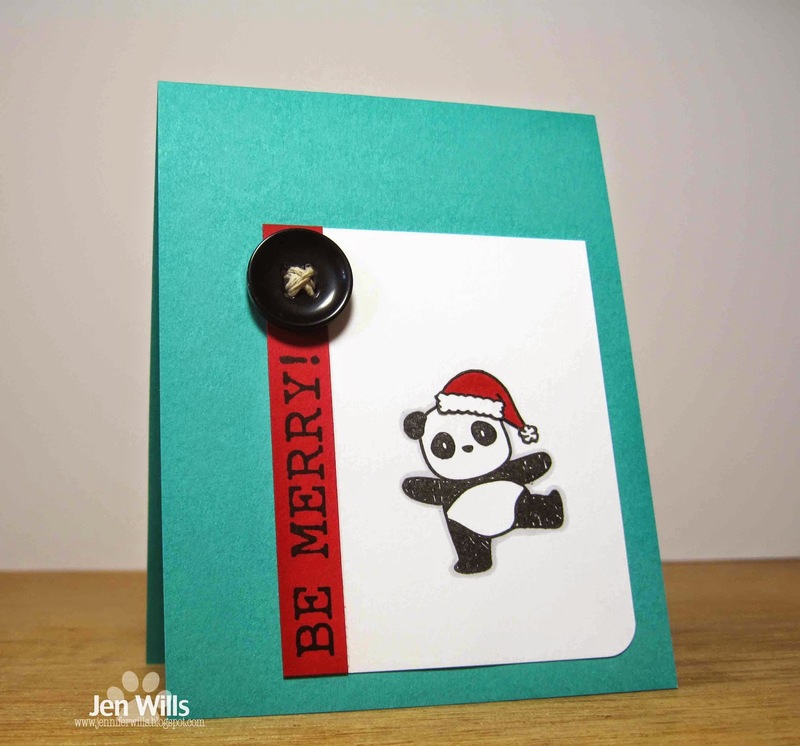 Quick, simple and flat for mailing. Awesome! 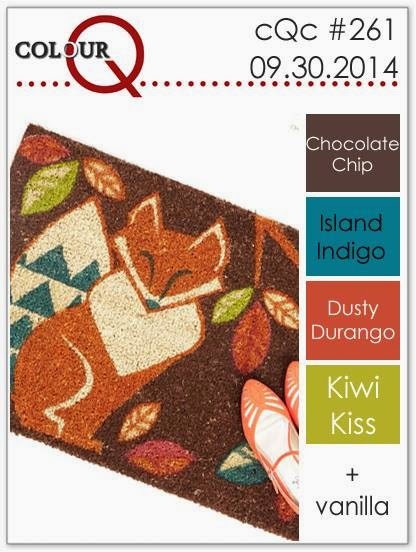 I love the little fox from Avery Elle's Happy Camper set and this week's ColourQ palette and photo immediately made me think of him. 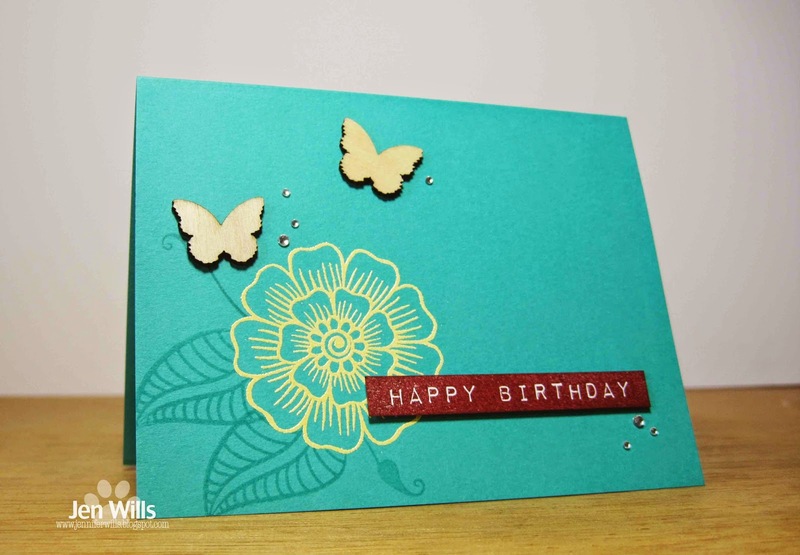 It's so nice when a card comes together so quickly and easily - just a bit of stamping, some fussy cutting and it was done! 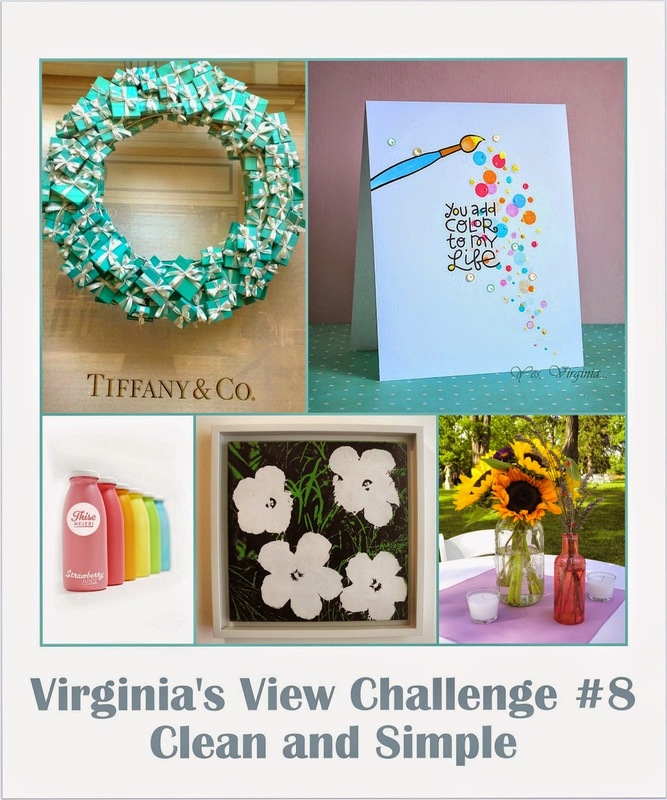 It's my kind of CAS card and because of that I'm also going to join in with the Clean and Simple challenge over at Virginia's View. Hope you're all having a lovely weekend! 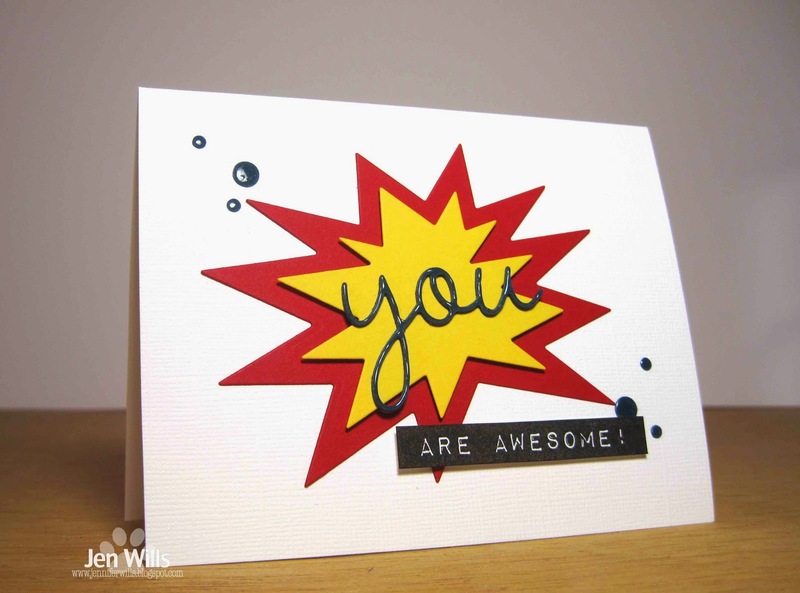 I am totally gutted that I did not take the day off of work today so that I could spend it in the Craft Cave for World Card Making Day. :( I have got to be more organized next year so I can really appreciate this holiday! 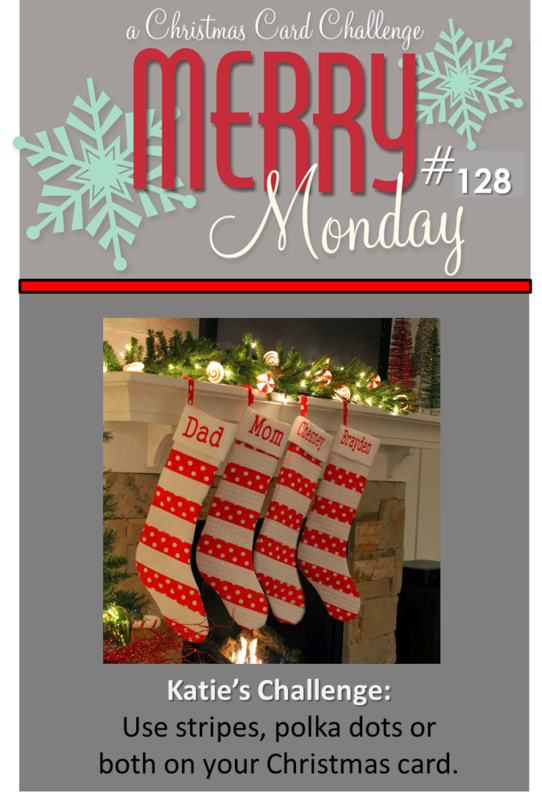 For now though, before I head to work, I'm going to share a card for two challenges - The Cutting Edge and Merry Monday. 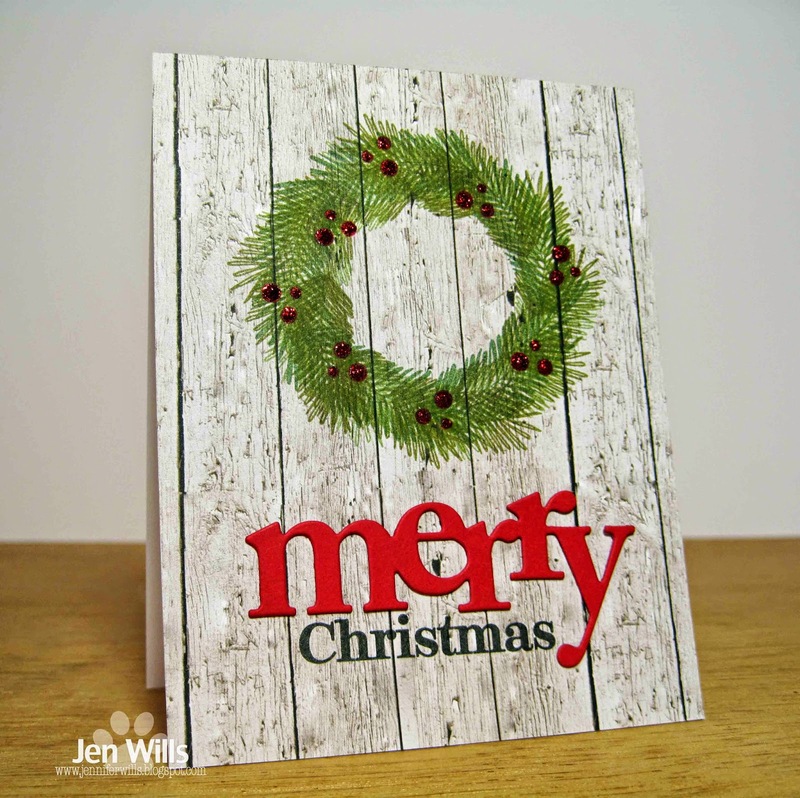 I think the Papertrey Ink Bells & Boughs set and the Wonderful Words: Holiday set are two that I use the most for Christmas cards. Do you have a Christmas set that seems to find it's way onto more cards than any others?